During the months of September and October our yard is loaded with ripe raspberries, and this year we also have an abundance of figs from our almost 20-year old tree. Raspberries and figs are a delicious dessert combination. This cake may appear rather plain on the surface, but the flavors blend beautifully (and you can always dress it up with a little whipped cream or creme fraiche). You can’t go wrong with browned butter, almonds, and raspberries along with jammy figs. If you don’t have access to figs, just add more raspberries to the batter. 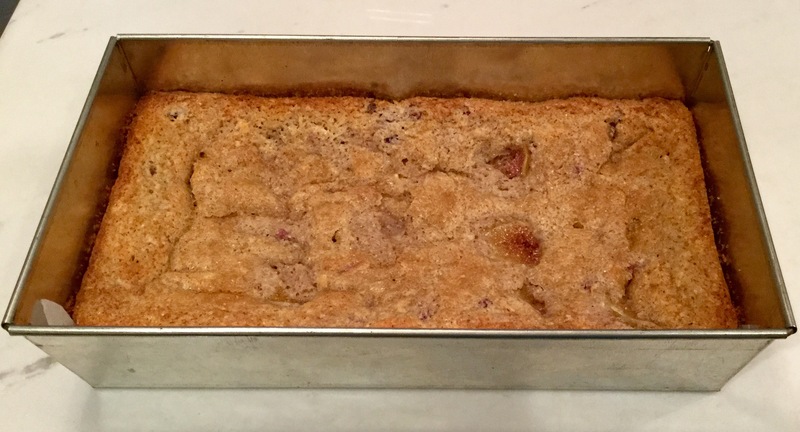 The recipe is a variation on an earlier post for Italian Plum Almond Cake. Preheat oven to 350 degrees. Grease a 9-inch springform pan or line a greased 12×6 pan with parchment. Begin by browning the butter. Place butter in a shallow pan and cook on medium low heat until it melts and becomes foamy. The foam will subside and eventually the butter will cook until it develops flecks of brown bits on the bottom of the pan. Be sure not to burn it. It will take 7-10 minutes. Remove from heat once the browned flecks have formed. Set aside to cool. In a medium size bowl combine flours, almonds, baking powder, salt, spices, and lemon zest. Mix well. In a separate bowl whisk together browned butter, milk, sugar, and egg. Mix well. Add extracts. Whisk in dry ingredients 1 cup at a time, then fold in raspberries. Pour batter into prepared pan. Place sliced figs on top, then sprinkle Demerara sugar over the figs and batter. Bake 45-50 minutes, rotating the pan half way through baking. Remove from oven when an inserted toothpick comes clean. Cool on rack. Serves 8. We can grow fig trees here? We gotta look into that! I’m wholly dependent on Costco right now! Yes you can grow figs here. They require a bit of TLC, but are worth the effort.